In the east of Christchurch overlooking the Heathcote Valley lies the Bridle Path subdivision. With lush green lawns and stunning pohutukawa trees, the manicured slopes of the old Villa Nova winery site and apricot orchard had for many years captivated the eyes and interests of investors and developers. The group of potential investors met David Fox on site one fine sunny March afternoon, liked what they saw, retreated to the Valley Inn to continue the feel-good factor, enjoyed the ambience of that facility and agreed to buy the 2ha site. And so it was that a Sales & Purchase agreement was entered into, and the property was purchased in May 2010. Disaster – disaster struck! The September 2010 earthquake shook the City, but the shallow February 2011 earthquake with its epicentre just meters from Lyttelton and the Villa Nova site brought the City to a halt. In the immediate aftermath of the February earthquake and then for some 3-4 years thereafter no new developments were permitted on The Port Hills. The Port Hills land wasn’t zoned red, the canvas was just left blank. 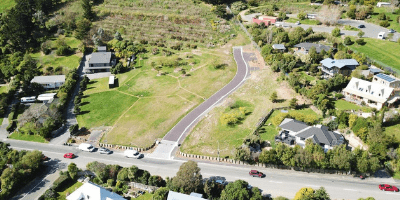 The Port Hills Geotech Group then produced a report stating that, like one of many sites across the Hills, the Villa Nova land was subject to rock roll and that only a small area close to the Bridle Path Road would be suitable for development. David’s vision for the subdivision was being blown apart. However, this geotech report looked suspect and it left David with serious doubts as to its validity. David then engaged a geotech engineer to produce a new and comprehensive geotech report based on a significantly different and more appropriate topographic model. The Independent Hearing Panel was appointed in 2012 to consider and hear objections to the new City Plan, and so David, armed with his alternative geotech report, appeared in front of Sir John Hansen, the chair of the Independent Hearing Panel. Questions were put to David at the hearing but with the City Council’s geotech officer’s report in support, the battle was won. At the same time, but with his planning hat on this time, David appealed against the existing and carry over nonsensical zoning standards for the land. Again, with the support of the City Council’s planning officer who was presenting at the IHP hearings, the battle was won. With the geotech and planning issues resolved, Bridle Path, which had the original 11 sections reduced to 4, had finally received approval for a site that would produce 13 sections. With geotech and zoning issues out of the way, it was now time to get the development rolling. We resolved water supply and storm water outfall issues, and with some politicking gained consent to build a one metre high wall in the road, produced in-depth engineering plans, obtained approvals and consents, and at the end of winter 2017, the site was ready to start development! As of August 2018, three sites have been sold, five more are in development with the remaining five to begin development soon. This was a project that had many ups and downs. But through creative planning and engineering, with perseverance and a willingness to go the extra mile, we were able to turn this subdivision into the flourishing development it is today!